Just a quick note that earlier this month we implemented new email notifications to go along with your activity as an OpenComps Pro subscriber. Now, every time you subscribe, cancel, re-activate, have a paid invoice or a failed payment, we will send you an email regarding each activity. Thus, you will receive your paid invoice directly in your email inbox, which is a feature that was high on the request list. As always, if you think you are not getting your emails, check your Junk/Spam folder first and/or add “admin @ opencomps . com” (without the spaces) to your email whitelist/address book. Feel free to always drop us a note about features you would like us to implement or if you have questions with your accounts. This entry was posted in Updates on March 15, 2013 by Svetlin. 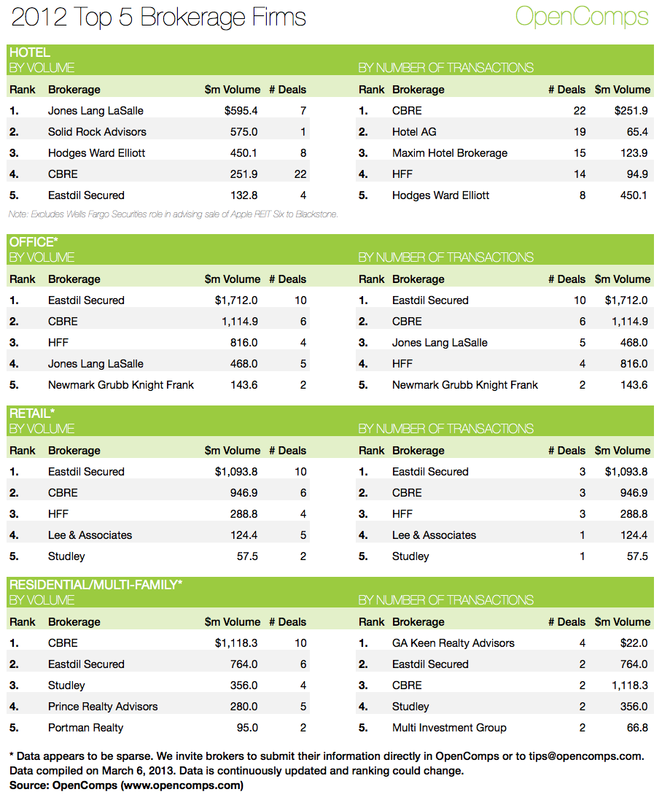 Continuing with the 2012 review, here is a snapshot of the 2012 Top 5 Brokerage Firms rankings as they stand on March 6, 2013. The data is dynamic and changes when new transactions are introduced in the dataset. For the full and most up-to-date 2012 list, you can go to the hotel, office, retail and residential rankings. Don’t forget the “Top Broker” dropdown menu to see who is the most active year-to-date (2013) or create your own custom period (the default gives you the all-time ranking). The table reflects United States only transactions as outside of the U.S., regrettably, our database does not have many datapoints. We welcome your input. The same is true for our Office, Retail and Residential data, even in the U.S. As a broker, you’ve worked hard to put the transaction(s) together. Shouldn’t you get credit for it? Register for OpenComps for free and update the transactions you’ve worked on or give us your unrecorded transactions. If you prefer to just email us, you can do so at tips@opencomps.com. Send us your one transaction or the in-house spreadsheet if you are that productive. You deserve the credit! Finally, the table represents top sell-side brokers. In OpenComps we also track buy-side brokers. But let’s be frank, sell-side is where the action is. This entry was posted in General and tagged 2012, hotel, office, residential, retail, statistics, top brokers on March 6, 2013 by Svetlin.